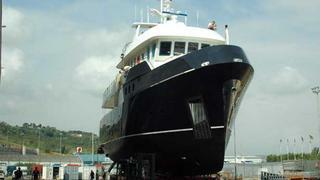 Cantiere delle Marche delivered a 25 metre custom explorer yacht to its owner last week. Named Furst 60, the yacht was a one-off project built for an owner who wanted his boat to be the epitome of an explorer yacht. With its high bow and deep blue hull, Furst 60 is reminiscent of a Nordic tug. But it is not just its looks that exude toughness, reliability and safety - Furst 60 has a heavy duty Moteurs Baudouin engine and single screw more typically used for commercial fishing boats and renowned for its longevity and low running costs. The owner also had one of the guest cabins modified to create a cold/dry storage room as he has plans for winter cruising on the other side of the Atlantic.